GoBankingRates conducted three Google Consumer Surveys, each targeted at one of three age groups: millennials, Generation X-ers, and baby boomers + seniors. The results weren’t exactly uplifting. Below are some of the most interesting findings, with images snagged from/courtesy of GoBankingRates.com. About 33% of Americans don’t have money saved for retirement, and well over half had less than $10,000 stashed. That number skyrockets when you’re just talking about females: 63% overall said they had less than 10K saved, compared to the 52% of men who hadn’t. Girrrrrrl. Do I want to retire as soon as possible? Do I know every word to “Aaron’s Party”? And my guess is you do, too. But on the whole, we aren’t acting like it. 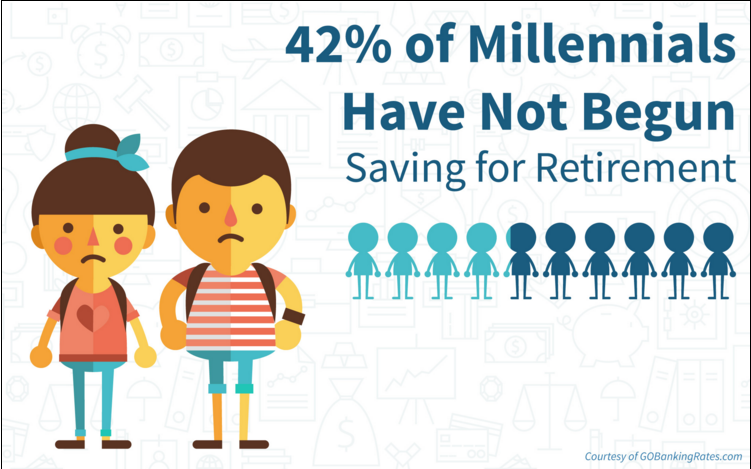 Or said more optimistically, 58% of millennials HAVE started saving for retirement. Are you part of the 58%? Uh oh. See how sad the little cartoon drawing of us looks? Let’s change it. If you fall into the 42%, I’m not judging you. When you’re in your first few years out of college or in the workforce, getting a couch that isn’t a fourth generation hand-me-down* can be a lot higher on the priority list than starting a retirement fund. Filling your fridge with something besides leftover beans and rice is hard enough, and we’re supposed to sacrifice money we won’t see for four decades? But it’s crucial. Unless you’re planning on marrying a royal**, it’s worth doing now. I mean, right now. As the saying goes, the best time to invest was yesterday. The next best time is today. Because of the glorious magic of compound interest, you’ll retire with more money if you start consistently saving NOW versus starting to put away a larger monthly chunk in 10 years. If you wait, you’ll be playing a constant game of catch up. 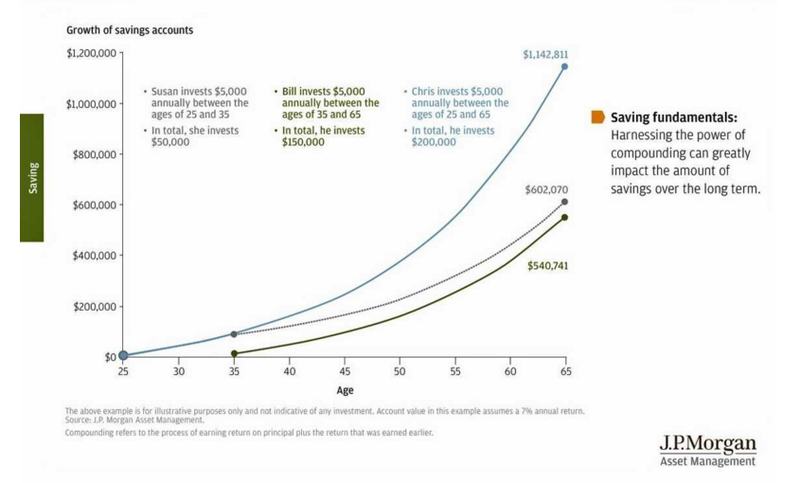 This graph from JP Morgan demonstrates how saving small early is better than saving bigger later, and that saving early and consistently is best. Susan invests for only 10 years early in her career, yet ends up with more wealth than another saver (Bill), who saves for 30 years later in life. Chris, the third saver, has the perfect scenario: He contributed steadily for his entire career. Be like Chris. Three in four (72%) of millennials have saved less than $10,000 or nothing at all. The study found that the most common amounts that younger millennials have saved are “less than $10K,” at 30%, and “$10K to $49K,” at 11%. That sounds negative, but that’s a great start! It’s hard to save $10,000 when you’re drowning under mounds of student debt or working three jobs to support yourself. It’s hard, but make every possible effort to put money away now so that you can reap the benefits in due time. So you’re not in the graph you want to be in? What are your next steps? Start saving for retirement ASAP! Here are a few immediate action items to add to your to-do list. The standard answer is to have anywhere between three and six months of living expenses saved up. Setting aside this extra money won’t add stress, it will relieve it — you’d be surprised how much easier you can breathe knowing that you will be OK if you get laid off or hit a surprise medical expense. Easier said than done, but get after it. Debt does not age well. Not one bit. Kill it. Contribute at least as much as your company will match. If your employer will match up to 5% of your income, you shouldn’t contribute a penny less. Otherwise, you’re leaving free money on the table! No two savers are the same, so this number will depend on a number of independent factors. I’ve increased my percentage twice now at my day job, and I swear to you — you don’t miss it. You don't have to put half of your income in there (I probably would if I could afford to live! ), but just keep creeping on up there. Inch your contributions up by 1% each year, and make sure if you get a raise, your 401(k) gets a raise, too. A safe, cushy, investment that will give me tax-free money in my retirement? Where do I sign. Read more about the pros and cons of an IRA here. I know, I know. You’re thinking, “Cool, sounds great, SC! I can handle all these savings tips, all I need is to make $1.8 million each year.” After emergency savings, debt payoff, 401(k) etc., etc., it’s like — OK, but how do I have money to eat? Striking the right balance is tough, but you have to try. Everyone is different (duh), so there’s no perfect formula. But here's the thing: Your percentile doesn't matter. Color-coded graphs aren't the end-all-be-all. All the stats and charts aren’t the most important thing. How are you contributing toward retirement? 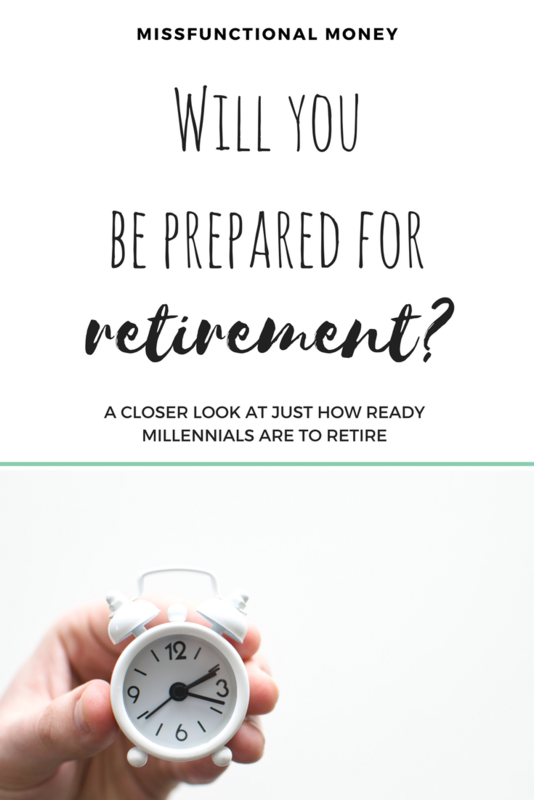 Is retirement saving on the back burner for you now? I want to hear from you! Let me know in the comments below! *I speak from experience. Although I enjoyed my roommate’s friend’s cousin’s frat brother’s black leather couch, purchasing my first couch gave a feeling of satisfaction comparable to an all-you-can-eat taco buffet. **Keep your paws off Prince Harry. He’s mine.